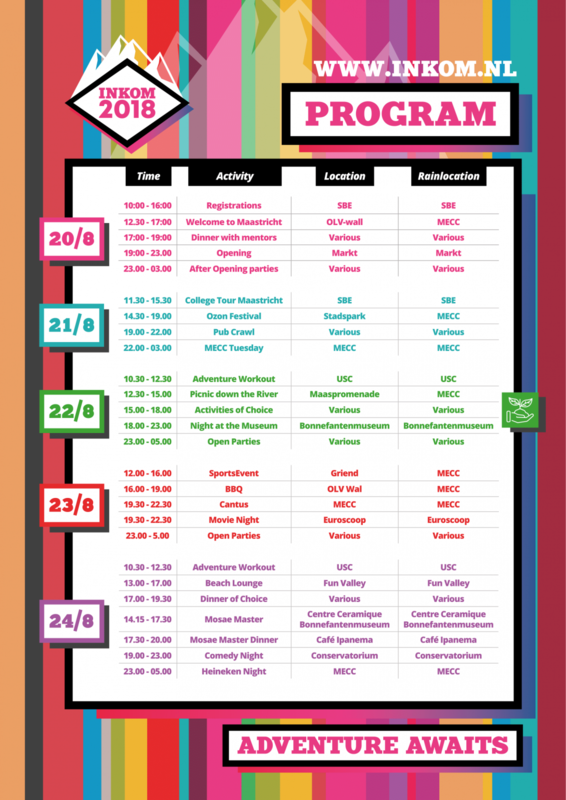 Het programma van INKOM 2019 is nog niet bekend, zodra deze bekend is kunt u het programma hier vinden. Om alvast een indruk te krijgen kunt u het programma van INKOM 2018 bekijken. Het programma voor INKOM 2019 is nog niet bekend. Kijk hieronder voor het programma van INKOM 2018 voor een impressie van de mooie week. You have registered yourself for the INKOM during the Registrations. Here you have received your INKOM bracelet, your durable INKOM bag, and this programme booklet! The Registrations is also the event where you meet your Mentors and fellow group members. INKOM 2018: Adventure Awaits has officially started! Only a five-minute walk away from The Registrations, you will find Welcome to Maastricht. At this event, you will get the chance to get to know your group. Besides, there is an information market, where you can receive all the information needed for your studentlife in Maastricht- ask questions to employees of the university and get acquainted with cultural, political, study and several other organisations. Share some pizza with your group at Domino’s, get a free coffee from Coffeelovers, and enjoy the relaxing music of the Red Bull hummer! Dinner time! Get to know the rest of your group better during a nice meal. Your mentors might show their cooking skills and let you experience typical student food. You can also decide to visit one of the many restaurants Maastricht has to offer. It is all up to you and your group! The Opening will be the official start of the INKOM and your student life! At the Markt, the Workgroup INKOM will open INKOM 2018 with a great show. There will be performances of fellow student DJ Duo Chuckster en MC Hanzie, the Lawineboys, the cover band Band with Benefits who will surprise you with their hits and mash-ups and last but not least the dutch DJ-duo Dirtcaps who will definitely make sure to get you on your feet. A great party atmosphere is guaranteed so make sure to come to the Opening to start your INKOM adventure! What would it be like to spend 1637 days in a Moroccan jail while innocent? Zuyd Hogeschool has arranged Motivational speaker Joseph Oubelkas to tell his story on how he was able to motivate himself while the world crumbled around him. Besides Joseph Oubelkas we have numerous workshops during this activity. These workshops can teach you techniques so that you are finally able to remember information, have you set manageable goals, or learn more about the Chinese culture. Haven’t gotten around to a festival this summer? Or looking forward to another one? INKOM provides you with the one and only Ozon Festival! On Tuesday, the Stadspark will be turned in a fairy-tale like city park which you can explore in many different ways. Several student associations will introduce themselves through exciting activities at the Supernova Area, Galaxy Area or Stardust Plaza. Our Universal stage will be filled with student bands and Funky Risotto, who will blow the speakers and turn the park upside down. In for some music in combination with some relaxation? Go to Planet X, where Centrifuge will hit you with some relaxed music while you can enjoy the Desperados Lounge or some food from our stands at Food & Beyond. Finally yet importantly, there are some interesting activities to find at the Milky Way. Are you ready to discover all that our Festival has to offer?! Criss Cross Maastricht: get acquainted with the bars run for and by students! Markt: by following this route, you will get to know the most crowded square of Maastricht during the night. Mini-Brandslang: More into a cultural adventure? Enjoy the famous Brandslang and get your drinks in the bourgondic atmosphere this city has to offer. Platielstraat: this route will show you the small, iconic Platielstraat, where all different inhabitants find their way – especially when the sun is out. Adventure awaits you this evening! We'll kick off the party with DJ Frame, a DJ who seeks out the adventure and peeks every mountain. Dive into the world of top party hits with Puinhoop Kollektiv. Join Jody Bernal and let those hips go completely! And last but not least, submerge yourself in the smashing hits of Paul Elstak and discover the devil inside you! - Wednesday 10:30-12:30 hrs: challenge your self during different activities and get to know UM SPORTS’ famous group classes. - Friday 10:30-12:30 hrs: a chill morning to prepare for the final day! Choose the Body & mind class or play a game. The workouts will last 1-1,5 hrs. Please bring sportswear, clean indoor sport shoes and a towel. You can use the changing rooms and showers at the USC. During the Activities of Choice different student associations, sport associations, fraternities, sororities, and other student organizations present their own activity. This will give you the chance to get to know the association/fraternity/sorority of your choice. Make sure you visit the activity that appeals most to you personally, as you do not have to be with your entire group during this activity. Check the associations program to see what activities you can join! Comedy, drama, theatre, opera, dance, art and various other types of act will perform in the Bonnefantenmuseum on Wednesday. The Bonnefantenmuseum will be turned into a true cultural playground: Night at the Museum. There will be a stage outside with great acts, but make sure you also visit the museum to look at all the surprise acts and activities you can find inside and the wonderful exposition of Melanie Bonajo. Indulge yourself in the different cultural activities Maastricht has to offer, and at the same time enjoy the food. You can get a free meal during Night at the Museum with a coupon from this booklet! This meal is made by Cato Cato, one of INKOM’s sustainable partners. On the fourth day of the INKOM it is time to get active! The University Sports Centre (UM Sports) and the Student Sport Associations will present themselves during the SportsEvent. You will find lots of information about all the Student Sports Associations, workshops and demonstrations. You don’t have to bring your sport gear, you can also just watch all the sports and consider if you are interested in joining these associations. Some Sports Associations will sell food at their stand, where you can pay with cash. Of course you can still buy drinks with your INKOM bracelet! After an intensive beginning, the “third half” will start at 14:30 and you can enjoy a beer at the bar! Are you interested in continuing sports during your studies, or are you ready to try something new? Then you cannot miss this event! After this intensive start of the day, it’s time to gain some new energy at the biggest barbecue of Maastricht! At the Onze Lieve Vrouwewal, one hundred BBQ’s will be waiting for you to enjoy some freshly grilled meat. If you are a vegetarian, have a food allergy or are on a special diet, please inform your mentors, because we also have a delicious meal ready for you. The BBQ is divided into two shifts, so be sure to stick to the schedule. The Movie Night is an activity that takes place at the same time as the Cantus. If you are younger than 18 years old, or prefer to relax and watch one of the newly released movies, you can come to the Movie Night at Euroscoop Maastricht (Wilhelminasingel 39). There is one cinema room reserved especially for the INKOM. Never before has such a great adventure awaited you: The Biggest Cantus of the world. The Cantusband will play the best sing-alongs, what an atmosphere! During the Cantus, it's possible to order your beer in the Cantus Pitchers, in addition to the regular cups. An abundance of beer, what more could you want! Do not take your best clothes with you and make sure your important items are packed safely with waterproof layers. The Cantus is only accessible for students that are 18+ and access will be denied if you don't wear the right age wristband. So please make sure you get one at the entrance of the Cantus. To keep things running smoothly, it is absolutely necessary that everybody respects the Cantus rules, which will be explained in advance. But most importantly: enjoy the evening and experience the adventure! Starting your day with lounging and partying at the beach? During Beach Lounge it’s possible! On Friday we will be enjoying the beautiful scenery at Fun Valley, while listening to relaxing beats by ‘Vaal & Tijn’ and ‘Tykon’. No need for a lounge, and looking for action? It will be possible to challenge your team at laser tag, paintball and ziplining! For these activities you will need to wear shoes and you have to be sober. In case you do not have a bicycle yet it will also be possible to make use of the INKOM shuttle bus. Fun Valley is located at 15 minutes by bicycle from the city center. Shuttle busses will depart from the taxi stand at the station. The first bus will depart at 12:30h and the last bus will leave Beach Lounge at 18:00h. During Mosae Master, all the participants and Mentors of a Master group (no Master students in a bachelor group) get to enjoy two rounds of workshops, and an amazing dinner. At 14:15 you will gather at the Central Hall of Centre Céramique. Next you can go to the workshops you signed up for, which will take place at Centre Céramique and the Bonnefantenmuseum. Visit the INKOM-website for an overview of the workshops. After two rounds of workshops, there will be a delicious buffet at Café Ipanema in the Bonnefantenmuseum. Here you will also have to opportunity to talk to the representatives of the parties that have given the workshops, in an informal atmosphere. Hungry after Beach Lounge? Several student associations, sport associations, fraternities, sororities, and other student organizations offer meals. Check appendix B to discover all available options. The price and whether a vegetarian, vegan, or gluten-free alternative is offered will be mentioned in the appendix as well. Please note that some of the associations only accept cash payments. At the end of the week, it is time to relax and have a good laugh before the last big party, the Heineken Night. We are very proud to present stand-up comedy act ‘Stranger Things Have Happened’. Stranger Things Have Happened improvises based on suggestions from the audience, so success is guaranteed. The event will take place at the Conservatorium. Last but not least, the final event, INKOM 2018, awaits you! To get into the mood, the men of ‘Loud N' Bright’ will kick the evening off. After this, ‘Rave van Fortuin’ will adorn the stage full of energy, but more so, pump up the party with their wheel of fortune. Next, ‘The Partysquad’ will let you enjoy the best hits and tastiest vibes. ‘Freddy Moreira’ continues this time with a run up to the last hour with ‘DJ Dannic’, who raises the roof one last time, closing the INKOM bigger and more adventurous than ever!